Headed out of town for the holidays? Don't get McCallistered! Keep the Harrys and Marvs at bay with these cheap ways to protect your home while you're away. If you have the good fortune of having someone close to you who's sticking around for the holidays, it won't hurt to ask if they'd mind keeping an eye on your property — maybe even house sit. Your house sitter can collect the mail — as mail and newspaper buildup is a telltale sign that a house is unoccupied — and make sure trash and recycling is put out if you're departing on an off day. The sitter's coming and going will keep activity at your home consistent to deter would-be burglars. Make sure it's convenient for whomever you ask (if it's out of the way, you should expect to pay), and stock the fridge with the sitter's favorite foods and drinks to make the stay more comfortable and enjoyable. Even if I'm not leaving town for an extended period of time, I like to keep my dining room light or the TV in my living room on to create the illusion that someone is always home — and that's not a bad idea, according to Alyse Ainsworth, safety and security expert at ASecureLife.com. "If your home looks like there are people in it, you'll be less likely to be robbed," she says. "Consider installing motion light sensors or even a timer for your exterior and interior lights. You can also purchase timers that can be controlled with a mobile app. You can turn your lights on and off strategically, making it harder for burglars to keep track of patterns." Yes, I do realize that keeping the lights on nonstop for days on end will hike up that month's bill, but it's only one room, and it's cheaper than getting robbed. I get it — you want to share your vacation plans with your friends on Facebook, Twitter, and Instagram, but in doing so, you may be giving someone all the details they need to clean you out during your daiquiri fest on the beach. If you'd like to share your vacation photos, do it after the trip is over when you're safe at home. You'll enjoy more of your vacay when you're present anyway; two for one. Before you leave your house for good, do one last check that all points of entry are locked and secure. "Robbers will see an unlocked door as an invitation to come in and take whatever they want," Ainsworth says. But don't forget the garage or windows, either. Burglars aren't particularly picky about how they get into your house, and they'll exhaust all their options before they give up if you've got what they want inside. Thieves don't just want your tangible things. These days, identity theft is perhaps more valuable than any material item burglars will lift from your home, and it's wise to keep that in mind when tossing receipts and other financial and identifying documents in the trash and recycling bins. "With the growing concern of identity theft, residents should also be mindful of what they're throwing out, being sure to utilize a paper shredder for documents with sensitive, personal information," advises Lynn Edmonson, regional manager of a property management firm in Florida. "Placing un-shredded items in the trash not only increases your odds of identity theft, but it is also a method for burglars to find out whether or not a home is worth the effort of being burglarized." Identity theft expert Robert Siciliano offers a great tip most people probably don't think of: Call the police before your house is robbed. Local law enforcement can provide basic tips on how to secure your home before a trip, and they also can tell you what's trending in neighborhood crime — like bike or tool theft from a shed, for instance, or if home break-ins are on the rise and what the burglars are typically looking for. 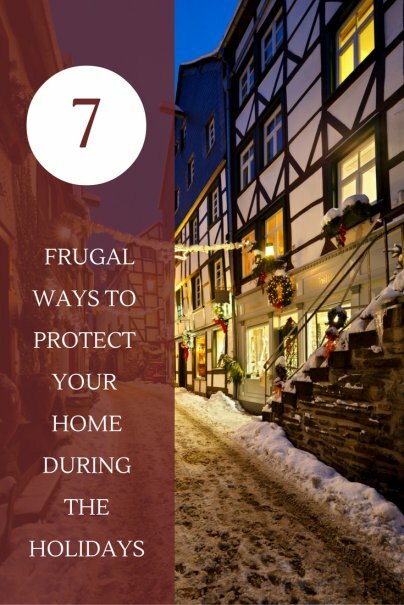 He also suggests looking for community programs in your area where law enforcement specialists are available to inspect properties and provide an assessment on how to fortify your home better. Dogs are great protectors of your property — even those little guys whose barks are worse than their bites, because sometimes all it takes to deter a burglar is fear of having his limbs gnawed off. If you don't like the idea of pet parenthood, however, at least take a trip to Home Depot to pick up a "Beware of Dog" sign to make thieves think you've got a snarling canine on the premises. Siciliano details how to make the setup look even more authentic. "Buy the biggest dog food bowl possible — one bowl for the front porch and one for the back," he says. "Writing "Killer" on the bowl will give a burglar the impression that you have a big and vicious dog. You can even buy a barking dog alarm." You can also buy door stop alarms. After you move your luggage to the car, put the alarms around the house and leave through the least-used door. Remember where you left, though! Put fake security signs and stickers around the house. Or use the vacation as an excuse to install a real one. You can also get fake security cameras. Also, contact your credit card company to tell them you will be on vacation, as well as read articles how to protect your credit card while on vacation.